You know that little black dress or the deep blue business suit you wear. Well here's an idea for a little Bling! to go with the outfit. 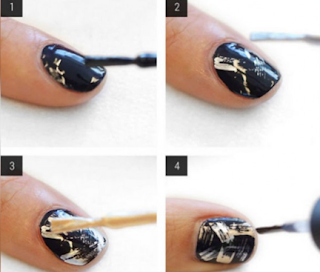 It's glam, but very easy to do. Now select a gold and a silver metal polish. Dip the brush in the polish and wipe it a few times on the side of the bottle so you only have a small amount on the brush. Swipe, graffiti style on each nail. You can't make a mistake, just scribble lightly....less is more. You can always add another swipe. Repeat with the other metallic. I love those!! I always find it hard to do deco on my nails because I can do it with my right hand, but not with my left. But I don't think you can really mess this up!